The signoTools are free programs to process the signature as an image. Simply add the image of your signature via a hot key in every Windows application. For Microsoft Word and Excel is a signotec Office add-in available which installs an extra button in the toolbar. The signoIntegrator/2 is stored in the Windows System Tray (for active programs). From here, you can just call up the program by clicking. Or even more simply: You define a hotkey in the program's settings. Then you have only to press the key combination which you selected before. The signoImager/2 is a program for automatically recording and saving signatures. An automatic function can be set so that you only have to start the program - the recording and saving of the signature take place without any further interaction. With the signotec Office Add-Ins you can create a PDF-Document and sign it or you sign direct in the Word or Ecxel document. A new toolbar will be createt in Microsoft Word and Excel. 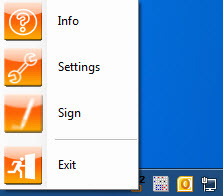 From MS-Office 2007 it will be a "Ribbon". Create a PDF and sign the PDF document secure. The document is converted to a PDF signed and sealed against future modifications and can be viewed and verified by any external user using the free Adobe Reader. This task is done with signotecs signoSign. Please recheck that you have installed signoSign or the free software package signoPAD-API which comes with the "Sigma" and "Omega" pad first!